To begin, I just want to make it known that this is not a movie for non-gamers. Meaning, if you don’t play much video games, don’t go see this movie. I’m sorry Scott Pilgrim, but I can’t lie to my readers. It is possible to enjoy the film without being a gamer, but the chances are very slim. And now onto the plot. Scott Pilgrim, the protagonist, lives in the “mysterious land” of Toronto, Canada. He’s a nerd, a bit of a jerk (breaking girls hearts all the time), and lives with his gay roommate across the street from the house where he grew up. One day he meets this girl named Ramona Flowers, falls in love with her, and begins dating her. Soon after this happens, he is attacked by Ramona’s first evil ex-boyfriend. He defeats the villain, but learns from Ramona that there are six more he has to deal with. And I think that’s all that needs to be said about the plot right now. Let me just say this: it’s told extremely well. The basic concept of how it’s told is that in a musical, when the emotion gets too strong, people burst into song. When the emotion gets too strong in Scott Pilgrim, people burst into awesome, video game fight scenes. That’s all it took to get me to see the movie. Great concept in my opinion. Now, the only way to have a great comedy is to have a great cast. And boy does this film deliver. 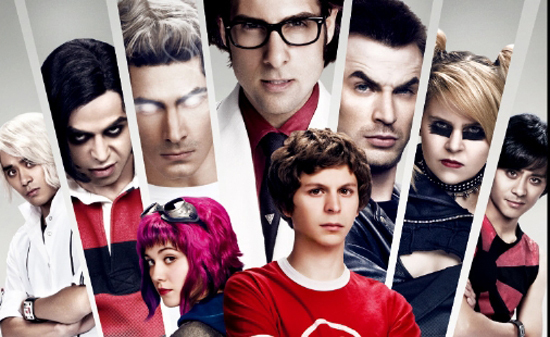 Michael Cera is the perfect Scott Pilgrim, and evolves from (and this is going to sound very cheesy) zero to hero excellently throughout the film. It was very believable Michael, seriously. And the lovely Mary Elizabeth Winstead did an excellent job as Ramona Flowers, not being flat or dull as I (forgive me) expected beforehand. The supporting cast was spot on as well, turning the world of Scott Pilgrim into a living, breathing, yet fantastic realm of excitement. Scott’s gay roommate, Wallace, was a riot. Everything he did had me hysterically. The evil ex-boyfriends were friggin’ hilarious, my favorite being Todd, the third of them. I won’t spoil his secret, but let me tell you that when you find it out, you’re going to laugh really friggin’ hard. I give major props to Edgar Wright, the director. I haven’t read the graphic novels that this film was based off of, but I’ve heard from fans of the series that he really made the story leap right off the pages. It’s really cool when a director is able to create a film that really respects the source material. Nice job, Edgar. Also, I’d just like to say that the music in this movie is awesome. I’m going to get the soundtrack off of iTunes soon. It’s great. And the way they incorporate it into the ex-boyfriend battles as an actual part of them is superb. Overall, Scott Pilgrim vs. The World is one of my favorite comedies already. It’s very funny, charming, and if you’re a gamer you really feel a connection to it. I love it, and hopefully so will all of you. See you next time.